About a month ago, Howies and adventurer Al Humphries set the microadventure challenge – to spend 24 hours (ish) close to home in the wild. Here’s my story. My microadventure came upon me suddenly. I was sitting with a cup of tea checking the five-day forecast and there, sandwiched by rain and heavy rain, was a full sun and a clear night – the first in weeks. Tomorrow was my window of opportunity. I checked my diary. I could squeeze it in between my hair cut (appointment at 2 pm) and babysitting for a friend (11 am the next day). Ready to spend the night in the wild - just me and my new Hunka bivvy bag. I had a basic plan – to sleep on a beach under the stars. For me, this adventure was about self reliance. 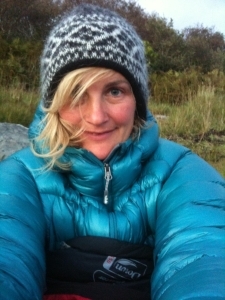 I wanted to spend a night on my own in the wild, an idea that made me, well, slightly nervous. Autumn was ripe in the air as I set off round the coast. The oak wood glowed soft and mellow, the evening sun picking out the flies and threads of cobweb. After a while the trees give way to heathland. 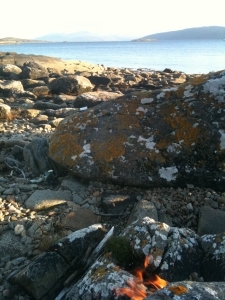 I tramped on, heather scratching my legs and bog sucking at my boots, until I reached the shore. The tide was out and the sun low. I jumped from rock to rock, my shadow one step ahead of me, leaving behind the places I know. I wanted to put a good distance between my normal life and this night, to get far away from roads and houses and people and familiarity. I wanted to feel the unease of a strange place. The fire catches and flames lick the boulder. 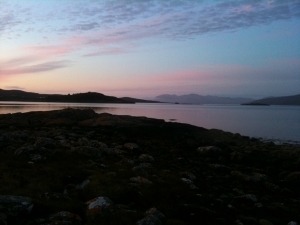 Dusk was beginning to fall when I found the perfect spot to spend the night – a small cove of sea-smoothed pebbles surrounded by boulders. I dumped my bag and went in search of driftwood. There was plenty in the tangle of seaweed that marked the tideline. I lit a fire. It was slow to catch, and the damp wood hissed and whispered. A sudden wind made its heart roar. Wine rattled into my tin mug. It tasted as ripe as the blackberries I’d picked earlier in the day. I’d been looking forward to this moment – the warmth of the fire, woodsmoke curling around me, and the gloaming, that half light of dusk that softens and sharpens. A boat sat on the horizon, glinting as the last of the sun caught its sails. The landscape was sinking into sleep. I was ready to join it. I stuffed my sleeping bag into my bivvy bag and climbed in. Was this really enough to protect me? I lay back and saw the first star prick the sky. I thought about the darkness that was falling around me, wrapping the trees, blanketing the paths. It made me feel tiny and exposed; a lone speck in a bag on a distant beach. There was no going back now. The night lay between me and my home, wild, solid and impenetrable. A breeze, a cool breath, crossed my face. It smelled of seaweed. I wriggled deeper into my cocoon and stared up at the shivering stars, eyes wide. The plough rested on top of the hill and the moon began its steady rise from the east. A shooting star traced the sky and I wished for sleep to come. It never did. Noises filled the darkness: hooting from the wood, scuffles from the undergrowth, grunts from the sea. I thought I heard the crunch of pebbles underfoot and voices on the wind. An engine rumbled. I sat up and saw the lights of a fishing boat flicker far out in the loch. The laughter of its crew carried clear across the still water. I checked my phone – 2am. The moon was high in the sky. The lichen shone ghostly white in its beams. About 6am the sky began to lighten. At last. I shook off my sleeping bag and stretched my aching muscles. I made a strong coffee, and watched the sun rise and the world return to normal. The sea was calm. Birds chattered and gulls screeched – comforting daytime sounds, welcomed by my rattled brain. I had an early morning swim with this handsome fellow. It was time for a swim. I picked my way over the rocks to a small crescent of sand, peeled off my layers and shivering as the morning met my skin. 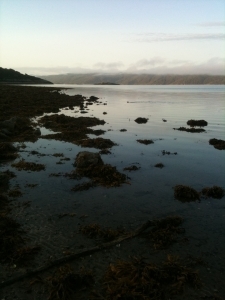 I waded out into the loch. A brown crab – big enough for the pot – stood frozen on the sandy bottom, his claws raised and ready like an angry boxer. I moved away and plunged under, the shock of the cold clearing my head and washing away the fears of the night. I emerged, tingling, the strangeness of the night gone, my mind and body back in place. As I started to make my way home, I heard a splash in the water in front of me. A head appeared, then a slippery back and a pointy tail: an otter fishing. 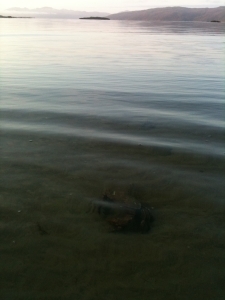 I crouched and watched it swim ashore. It looked at me with its whiskered face, held my gaze and then slipped back into its watery world. See that wee dot in the water at the back? That's an otter. Honest. I slipped back into my world too. With each familiar task back home, making a phone call, boiling the kettle, having a shower, my night on the beach retreated, became more unreal. But a bit of it remains lodged inside me, dark, wild and fiery – a reminder of something bigger, more enduring. I was part of that night and now that night is part of me.